WOW, we broke a million download, thank you all so much! 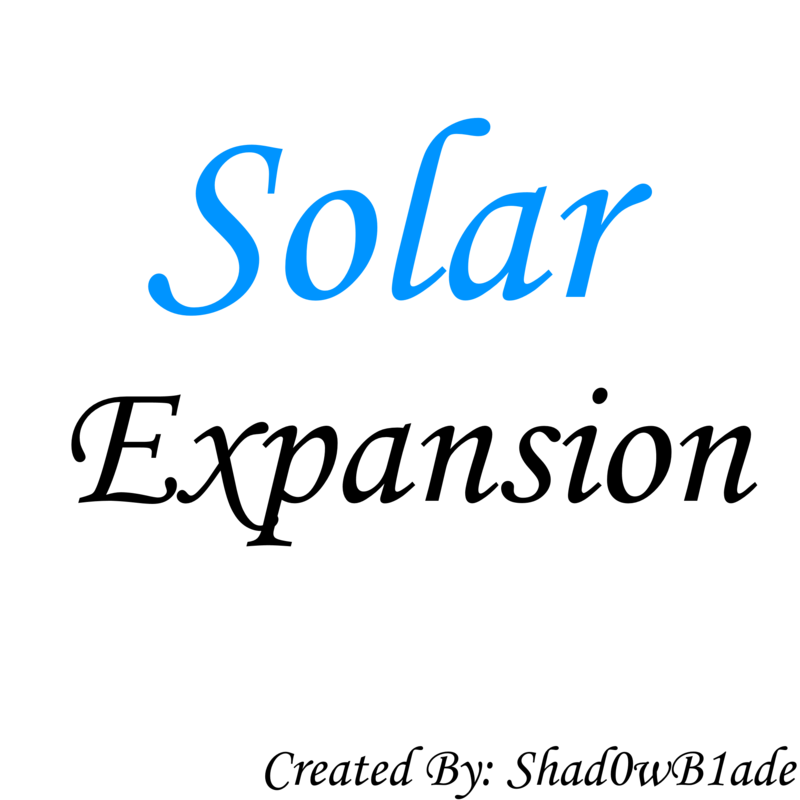 There are now 2 versions of Solar Expansion one for basic users and the other one for map/modpack creators! And they are called BASIC and EDITABLE in the files section! Please visit the Minecraft Forum Thread for more info and the Wiki! I am back you can read through GITHUB why! I found out that forge puts the 1.6a+ editable and basic version as 1.7.10, but if you put "-Dcofh.rf.crashOnOldAPI=false" in your jvm arguments it will force it to use the mod. But be prepared to see bugs. I always loved playing with this mod in 1.7. I hope there's going to be a 1.12 port someday. Any plans for MC 1.11.2? Yeah maybe, I could do a quick port. I've just been really busy and haven't even logged onto my account in a very very long time. What are the max values we can put for the editable version? Looks like it's the signed integer maximal value, since the mod reset the configs to 1 for all values above 2.000.000.000 but putting 2.000.000.000 gives 1.000.000.000 in game. Even 1.100.000.000 becomes 1.000.000.000. I assume 1.000.000.000 is the max? (I only tried on capacity values for now, I'm not going to make panels generating billions of RF per ticks). Is there any way to have a different color for each tier? It's kinda difficult to know which tier is each panel. AE energy api is compatible with the RF energy system, it would be pointless to make stuff with AE energy because its not even needed. RF energy kinda became a universal energy system that everything works with (almost everything). If you give me a reason to make a seperate thing for AE I might do it, but right now I don't see the point in doing that. I am going to be uploading the Editable version by the end of the week so... you can use that so that you won't need Thermal Expansion. yes the editable version does not need anything... but I would say wait for the update that will come by the end of the week! Oh, basic one worked anyway. You only need cofh core i guess. Lapis Shards have nothing special about them, they are like a vanilla crafting recipe, it shouldn't have any problem. It might be some other mod I don't know. I remember direwolf20 having problems with crafting and stuff because of binnies mods I think and it needed an update, but I don't know it's just a simple item with a crafting recipe that has nothing special about it. Maybe give me a log?